Ratzinger’s life was spent in pursuing and articulating the truth in all of its nuances. He dared to do what no other pope has ever done, letting himself be interviewed for the length of a book in Light of the World. After news of his candor broke, I recall a friend of mine who remarked on the “idiocy” of him commenting on condoms. The complicated ethical assessment as pope was congruent with who he was as a young professor, a man unafraid to speak the truth with love. Pope Benedict simply smiled when someone informed him that people would run roughshod with his remarks. A hero has a certain self-possession that does not allow the whims or ignorance of others to get the best of him. As one of my mentors has reminded me, in all of Ratzinger’s life there is practically no one who can say that he personally “lashed out” at them. With aplomb akin to “good Pope John,” he has guided the church with wisdom and sweetness. Ratzinger could have had reason to be prideful since (as St. Paul notes in 1 Corinthians 8:1) “knowledge puffs up,” but instead his life testifies to the reality that “love builds up.” Knowledge is power, both of which he possessed abundantly. He showed the heroic possibilities of power directed toward the good of the church. His meetings with abuse victims in various countries were particularly moving. One victim present at such a gathering in Malta reported the Pope “wept” there with them. Ratzinger’s relinquishment of the Petrine office is the consummation of his vocation as “servant of the servants of God.” It seems Pope Benedict’s baptismal name was aptly chosen. Joseph, the universal Protector of the Church, was a heroic figure entrusted with the Blessed Mother and God’s own Son. Yet Joseph’s heroism was hidden in history; his was a life of diminishment to the extent that Scripture does not even tell us what became of him. In the Spiritual Exercises, St. Ignatius sought to help people answer the “Call of the King,” to live under “the Standard of Christ” even to the point of rejection and to follow God’s Spirit that sends us to do everything for God’s greater glory. We would do well to contemplate the life of Joseph Ratzinger as we pray for him in his remaining life of prayer and penance. His was not the cool release of power, the act of a noble politician like the Roman dictator Cincinnatus. It is what Archbishop Gomez of Los Angeles calls “the act of a saint.” Joseph Ratzinger is proceeding in obedience to the One who was nailed to a tree, accepting with and in Him a strange humiliation. Surely he recalls that the first Bishop of Rome was publicly hung upside-down. Many have suggested that Pope Benedict’s was a failed mission. The circumstances of his time in the papacy were not ideal; many goals eluded him. Yet let us remember another Man who at the end of his life was judged a failure. And no servant is greater than his Master. I imagine that a tribute like this is a counterpoint to the many less generous assessments in both religious and secular press. As with anyone, is there an "...and" that is at least as equally relevant. the Bard on Caesar's death is yet true, but personal piety is not an adequate rebuttal to so much harm that may not have been vincible, but nevertheless was done in this Pontificate. I agree entirely with Jesuit Priest John Roselle that Pope Benedict XVI was humble and heroic, an example beneficial to the whole Church. May his retirement be prayerfully peaceful, spent in quiet solitude, offering his personal dark night of the soul, the (his) Papacy, to Christ for the Church. I hope the new Pope will be a younger man, acknowledged by the Men in Red to be “the one” through the gentle coo of the Spirit Dove, black feathered! May he be successful in cleaning-up scandals in the Church, which in initial form began long ago with denial and betrayal on “ the night before he died” extending all the way back to the plenteously graced First Parents of the First Family of God , Adam and Eve who prefigured the Church, we the People of God, all sharers in the denial and betrayal of Eden’s folly, in some way or the other! God bless the new Pope! God bless the Church! I appreciated the attention you gave to Pope Benedict's obedience, humility and gentleness. These qualities are rare to find in someone as knowledgeable as him. Thank you! And blessings to our church during this critical time of discernment. Bravo! Excellent article!! Mr. John Roselle, SJ brought to the fore the deep GOODNESS of Pope Benedict XVI! His interplay between Ratzinger's accomplishments before the Papacy as well as his courageous contributions in the Vatican were well woven into the wisdom of St. Ignatius' "Spiritual Exercises". Thank you, Mr. Roselle, SJ for such an insightful essay on this holy man whose leadership many of us are already missing! For certain, we will follow in his stead! Beautiful article! I agree with everything you wrote. Pope Benedict, and all of us, need to emulate Christ's humility and love, especially when the world tells us that those Christ-like qualities are not desirable! Love you Papa! What a beautiful article! I love the symbolism of Pope Emeritus Benedict XVI as a true Christian hero. There is a lot of media right now doing its best to discredit him and the Church, and it is a beautiful change to have an article that poignantly depicts the holy man he is. ". . .he has guided the church with wisdom and sweetness." How perfectly this statement epitomizes the papacy of our beloved Benedict XVI, who imparted his great learning to the world with such humility and gentleness! What a wonderful article!! Indeed, Pope Benedict XVI will be forever known as the unafraid Pope-scholar. This article highlights the Holy Father's unique devotion to truth, however unpopular: as written above, "He was as a young professor, a man unafraid to speak the truth with love." During his papacy, Benedict XVI specifically targeted two serious issues in the Church - relativist youth and experimental Church musicians. To the youth, gathered in 2008 at Dunwoodie Seminary of St. Joseph in New York, he said that relativism is a growing malady that must be stopped by this generation; it is no longer satisfactory to relax our morals and say that "whatever is good for me is good for you." To the Church musicians, who misguidedly brought rock n' roll music to youth Masses, Benedict XVI stood firm and defended the sacred solemnity of Mass. The youth loved him as a pillar of truth on these matters, in a world where lies and permissiveness abound and destroy our identity as young Catholics. Pope Benedict XVI always stood for what was right, even when an increasingly materialistic society criticized him for it. I love this article! It's so beautiful how God works to guide the Church to serve the needs of the faithful. 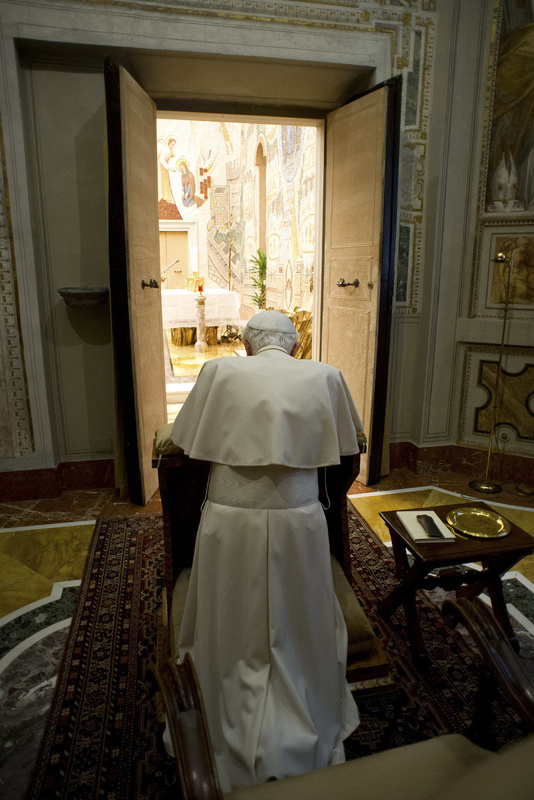 Pope Benedict's resignation shows no failures, only strength in following the will of God. And we are given such an awesome example in holiness to follow! Thank you John S.J. for this fair and beautiful article. Resignation of the Pope was a demonstration of his intelligence, humility and that he did´t love power. It was good this article by a Jesuit. The Pope believed in you, yet not all Jesuits believed in Him.